Some time ago I promised to cook a Sunday lunch at my parents’ for the family and S. I was completely out of ideas and had no vision whatsoever. Such times call for a visit to my favourite butcher, Reinin Liha, at the Hakaniemi Market Hall in Helsinki. The market hall was opened in1916, and has been an excellent source of meat, fish and produce ever since. Reinin Liha is considered one of the best, if not the best, butcher in Finland. They have been in business for 56 years, and their experience really shows in the service. I was supposed to serve the meal at 3 pm, so I decided to buy the meat the day before. I know few better ways to look for an inspiration than browse the meat-filled counters at a butcher store. It didn’t take for long when I went to Reinin Liha to find beautiful lambkin shanks. When I saw them I immediately knew they’d make the perfect dish to be prepared in my brand-spanking-new Emile Henry earthenware round casserole. I prepared the lamb shanks with the recipe I got with the shanks. They were marinated in garlic, thyme and rosemary spiced olive oil over the night. On Sunday morning I did the unthinkable and woke up before nine so that the shanks would have plenty of time to simmer in low temperature. The longer you cook them, the more tender the shanks will be, and ultimately will fall of the bone. Yummy! I cooked mine for 5 hours. Prepare the marinade by mixing the oil and spices. Let the shanks marinade in a fridge overnight. Heat the oven to 150 C / 300 F.
Put the shanks close to each others in a deep pot, the bone facing up. Pour the marinade over the shanks. Pour the wine, about half a bottle, until the shanks are covered up to half their height. Cover the pot with a lid and lower the temperature to 100 C / 225 F after 30 minutes. Let cook for about 5 hours until tender enough to be eaten without a knife. Sieve the jus, cook together, and serve as a sauce. Mashed potatoes go well with the shanks. Try mixing a few tablespoons of pesto with the mash. Now that’s a good boy! Great picture, nice recipe and the mention of Hakaniemen tori raised very nostalgic feelings for a long-lost period in life. That looks amazing! 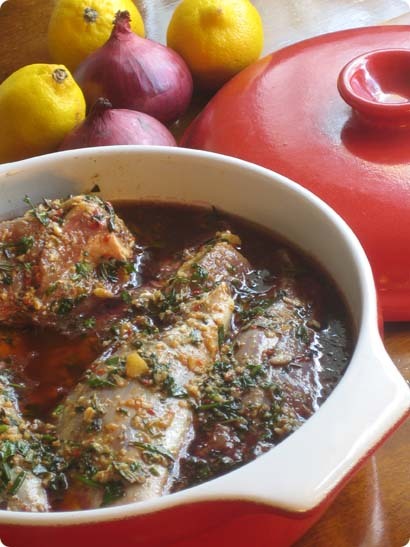 I love lamb shanks and anything slow cooked to tender…Mmmmmm! :) Nice casserole!